Between FATCA and changing Swiss banking laws, Swiss Democrats can find themselves feeling between a rock and a hard place. At the beginning of this month, the Democrats Abroad International Committee passed a resolution to reword the FATCA definition. If the resolution becomes legislation that gets through Congress, this would help all americans overseas. 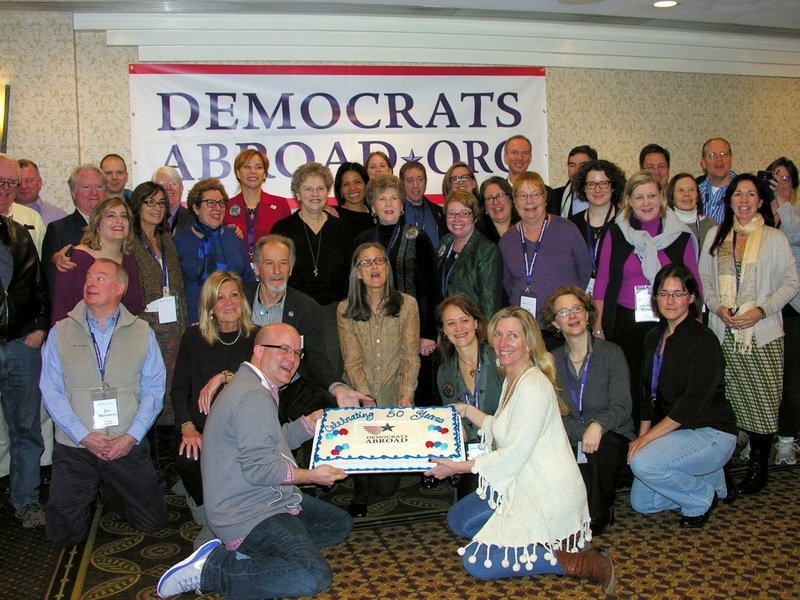 Fifty years ago this year Democrats Abroad was created and today is still the only official overseas branch of a U.S political party. Thanks to them, Democrats and Republicans alike can now easily vote from abroad, and the voices of democrats living abroad are now represented by eight delegates to the DNC. There is still much to be done. Help make our voice heard by helping us to continue to grow. By registering every year and by voting we can also make a difference. The Republicans are pouring untold amounts into the upcoming midterm elections. Don't let money determine the outcome of these races! Don't let our system be corrupted by the few. Let us Democrats use the means we have at hand, and get out the vote for the candidates that best represent our values, for us and for our children. 1. Thomas Fina's monthly Letter from Washington. 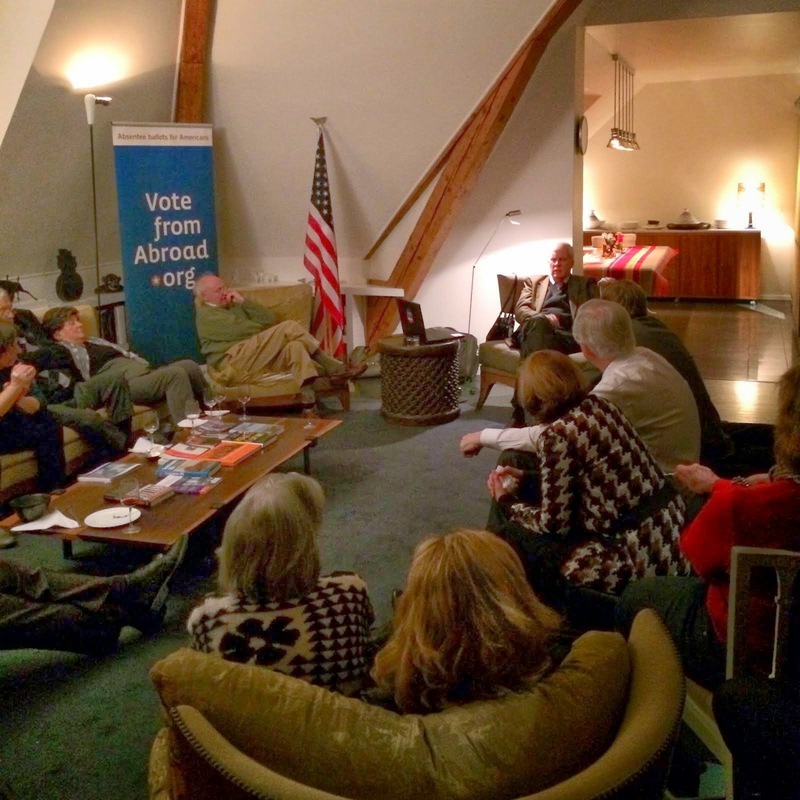 Tom was Executive Director of Democrats Abroad for many years, now retired. He offers matchless insight into the latest developments and outlook in Congress and the White House. Go to blog.democrats.ch and look for the post of Wednesday, April 2. 2. First edition of the Democratic Women's Alliance Newsletter, straight from the women leaders at the DNC and activists around our nation. Forwarded by DNC member for DA, and ex-DACH Chair, Caitlin Kraft-Buchman. A new monthly DACH Geneva get-together, starting in April. It will be a place to meet up with like-minded individuals and discuss the hot political issues in an informal and relaxed atmosphere. At Spanish-wine bar le Soleil Rouge: Wine, beer, tapas. We expect to meet up the Second Tuesday of every month, so mark your agendas! Where: Le Soleil Rouge, Boulevard Helvétique 32, Geneva. Cost: Free. Drinks/nibbles a la carte. DACH Zurich get-together. As in Geneva, meet up with like-minded individuals and discuss the hot political issues in an informal and relaxed atmosphere. At La Stanza Bar. Come and join us! If popular we could make this a regular event. Cost: Free. Drinks a la carte. Come join student democrats in Geneva, First Thursday of the month. * As part of our goal to inform DACH members about Democratic Party, campaign, and Political Action Committee fundraising activities taking place in Switzerland, we are happy to announce such events that are made known to us. These events are not organized, funded, or conducted for the benefit of Democrats Abroad. Just confirmed: Sen. Kaine will give a late-afternoon speech at the Graduate Institute, Geneva on Wednesday, May 28. A cocktails reception and dinner will follow, for those who would like to meet and talk with the visiting Virginia Senator. More details to follow. Democrats Abroad's gala 50th Birthday Party! took place in the elegant ballroom of the Woman's National Democratic Club in Washington DC, NW on Saturday March 1st. The room was full of Dems Abroad gathered from around the world, and many guests. Featured speaker was Senator and friend of DA Kirsten Gillibrand. The gathered DA leaders continued on Sunday and Monday (in the snow) to conduct the important business of DA's Annual Meeting. Chair Anne-Shelton Aaron represented DACH in person. Vital decisions were made, training was held, and resolutions were passed. Many more who couldn't make the trip attended on-line via an excellent WebEx link. 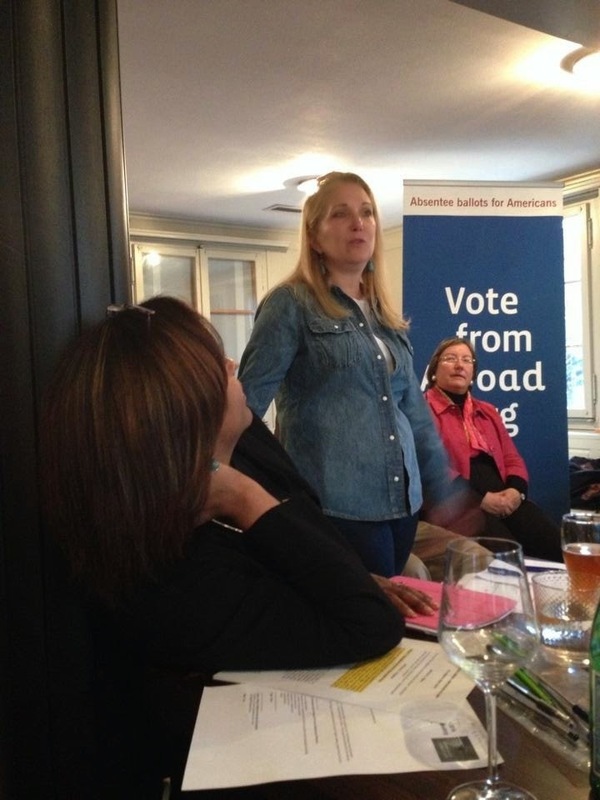 Tuesday and Wednesday were the "Door Knocks": Members calling on Senators, Congresspersons and officers at the IRS, Treasury and State, to discuss the urgent issues faced by Americans abroad. DA presented our positions on taxation, voting rights and citizenship rights, to many receptive ears. Five days of effective lobbying on your most acute concerns, by your hard-working DA leaders. DACH held its Annual Meeting in Zurich this year. It was successful and quite enjoyable too, at the Fork and Bottle Restaurant, well-known by area Anglophones. We heard reports of the year past, plans for 2014, and successfully amended the by-laws to bring them up to date. Following the country-wide meeting, the Zurich Chapter held elections. 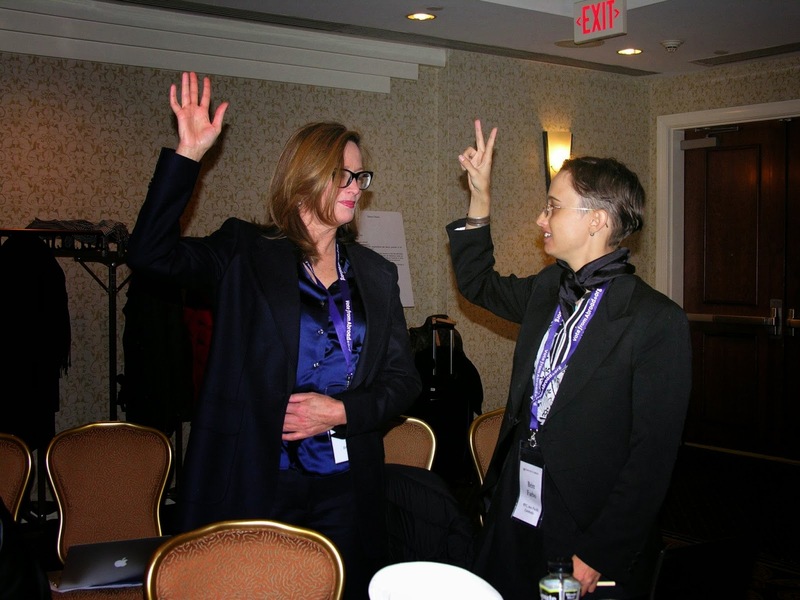 Renee Rousseau said goodbye as Chair after over two years of keeping DA's profile high in the Zurich area. Annamaria Fato was elected your new Chair for the next year. As her first act, she appointed Myrtle Alexander her vice-chair. The new team aims to attract a lot of new members across Swiss Germany in this 2014 election year. No secretary/treasurer was elected, as the updated by-laws no longer require a chapter to have one. Michael Parmly finished the afternoon with a most interesting talk on the history and future prospects of the Guantanamo Naval base and prison, including his own proposal to give the land back to Cuba in return for a long-term agreement to let the US stay. Animated discussion on Cuba kept the group going until well after 6pm. The room was overflowing and the discussion could have gone all afternoon, as DACH along with The Graduate Institute, the Geneva Center for Security Policy and LeNews.ch presented a lunchtime panel discussion on "Afghanistan Post-2014 - Have we learned anything from history?". Moderator Ed Girardet (editor, LeNews) and four panelists laid out their view of the history and future of the conflict, and the role of foreign forces. DACH was there to register American voters and sign up new members. As part of our 2014 Speaker Series, we will be presenting more issues-based talks and panels at the Graduate Institute and elsewhere. Watch these newsletters! The paired evening dinner was just as rewarding for attendees. It was an intimate evening where DA members got to pursue the Afghanistan theme with several of the panelists, around a nice meal, while also being a successful small fundraiser for DA. 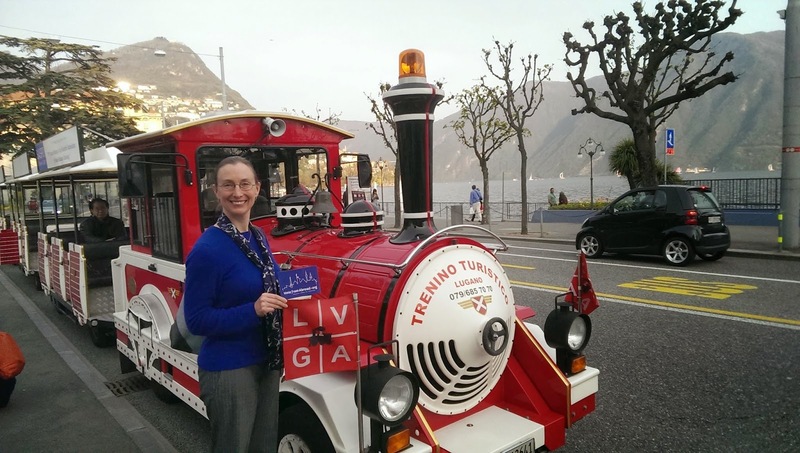 ExCom members Anne-Shelton Aaron and Emily T. Blitz travelled from Geneva to represent Democrats Abroad at the Lugano Expat Expo, to meet Americans, introduce them to DA and help them register to vote in 2014. Traffic through the Expo was low -- the Ticino Spring weather was too gorgeous? But they were able to sign up new members and help others register to vote in the 2014 elections. Reminder: Americans abroad need to request an absentee ballot in each election year in order to vote in the primary and/or general elections. If you missed the Expo, do it from your computer today! Go to www.VoteFromAbroad.org to register and request your absentee ballot.